SD cards are used to increase the capacity of a particular devices like Cameras, Mobile Phones. And SD card reader is a tool that helps the SD card to attached with them so that storage data can be accessed. SD card reader can be external or else inbuilt on a larger device. SD card reader helps SD Card to get connected to another device, such as a laptop or computers, where the files can be accessed. 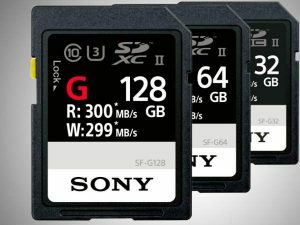 One of the world largest Tech company Sony on tuesday unveils its brand new “world’s fastest” SF-G Series SD card that comes with enhanced features specially designed for professional photographers and videographers. With a write speed of up to 300MB per second, the SF-G Series gives tremendous boost to portable devices that also supports maximum performance of digital imaging devices, contributing to longer continuous shoot of high-resolution images. It contributes to a shorter buffer clearing time as well. Japanese Tech giant launched world’s fastest SD card which are available in 32GB, 64GB and 128GB capacities which gives to notch speed of 300MB per second to transfer large volumes of files and data quickly. The card can record 4K video with DSLR and mirror less cameras. It is also capable of recording 2K, Full HD and XAVCS Codec. As ever body knows that Sony has history of creating more highly efficient quality devices. And in this case also using Sony’s algorithm, the card also prevent the decrease of data-writing speeds and contribute to the camera’s ability after successive burst shoots. Customers who will be purchasing this SD card, Sony is also providing complimentary free software named as “Memory Card File Rescue” to help recover photos and videos, including RAW images and 4K XAVC-S video files that may have been accidentally damaged or deleted. Sony has applied years of experience in professional media to expand the current high performance memory card line up with an ultra-fast speed model that will maximize your camera performance. Along with the new SD cards, Sony also introduced SD Memory Card Reader to enable fast and convenient transfer of data to a personal computer. The SF-G32/T1 IN card is priced at Rs 6,700, SF-G64/T1 IN at Rs 11,000 and SF-G128/T1 IN costs Rs 19,900. All the cards have five-year warranty and will be available from April 3. The MRW-S1/T1 IN card reader is priced at Rs 2,300, comes with a year’s warranty and will be available from April 3. We are living in a 21st Century and in a world of 4K high resolution gadgets and devices. Customers are always looking for more high resolution photos and videos to capture their precious unforgeable memories. Today we want 4K resolution in everything like Television, Monitors Cameras, Desktop Personal Computers, and Smart phones but still we are lacking in storing this huge high reolution data. Still today more and more tech giants are making lots of research in making SD card which can store more data and can run much more faster.